20’’/40’’ REF, 40’’ REF High Cube. Customers often request door service, in these cases ocean stage goes together with auto or rail delivery (i.e. multimodal delivery). Due to several years of cooperation with leading ocean carriers CMA-CGM, MSC, APL, Hapag Lloyd and others, we can secure competitive rate levels while saving high quality standards. 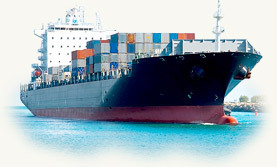 Choice of ocean carrier and transportation type depends on the route and shipment parameters. Our managers will help you to find best solution based on cost, transit time and other needs. Please click here to send your request. LCL service from the USA and China to consignee’s door.